Torabi study (1999) on Kashan plain groundwater showed that the average subsidence of the water table has been about 16 m during 1965–1997 and the average electrical conductivity increased from 3.4 to 6.9 ds/m. Considering the excessive bring out of groundwater in Kashan plain, further studies on the quality changes are particularly required in terms of salinity. Therefore, in this research, salinity changes in groundwater of Kashan plain were studied. Kashan plain which situated in south of Salt Lake in the center of Iran is an important natural and economical area in Isfahan province. Its altitude is averagely about 970 m. It is classified as arid and warm climate. In this plain, the annual precipitation is <130 mm, while the annual potential evaporation is 2700 mm. Kashan and Aran-Bidgol cities have been located in this plain. Agriculture is the main occupation of the people from the past. Textile, carpet, automotive, and metals industries have been established in the recent decades, due to the increasing population, water demand has been increased sharply. Arid climate, low precipitation, high potential evaporation as well as increasing water demand because population growth, agricultural and industrial development, have been led to the groundwater table decline and diminished water quality in this plain. 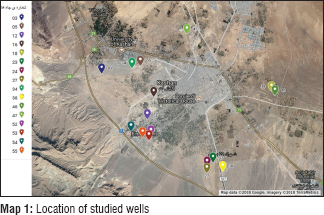 This research is a descriptive study which has been performed using data from 2006 to 2013 regarding the water quality of some wells in Kashan plain. In this research, the data of 112 wells were received from Kashan Water and Wastewater Company. Only the data of 16 wells were available in a complete and regular form that was analyzed. 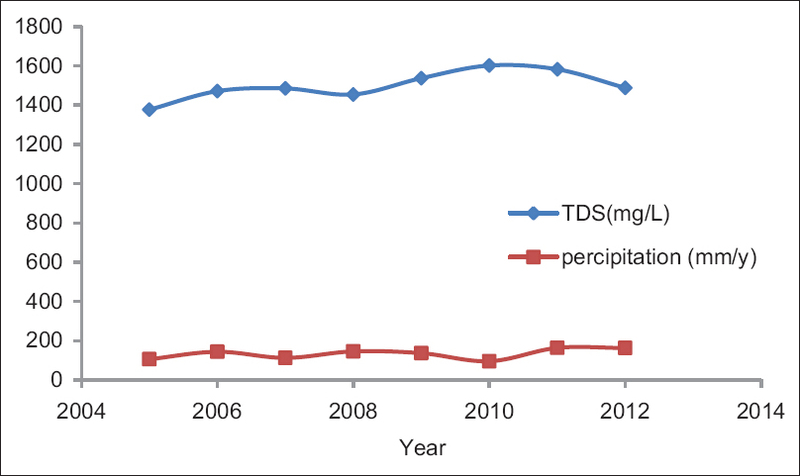 In this work, variation of Total Dissolved Solids (TDSs) has been considered as an important indicator of water salinity variation. The position of the wells is shown in [Map 1]. 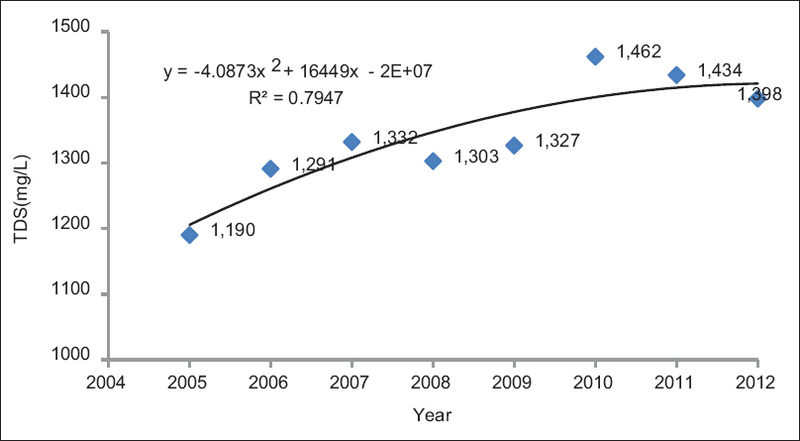 The results show that the total amount of dissolved solids in the 16 well water samples has been increasing so that the average value of dissolved solids in these wells during the 8 years has been increased from 1190 mg/L to more than 1400 mg/L [Figure 1]. [Figure 1] shows that subsequent of the increase in annually precipitation, the salinity of well water ' is reduced. 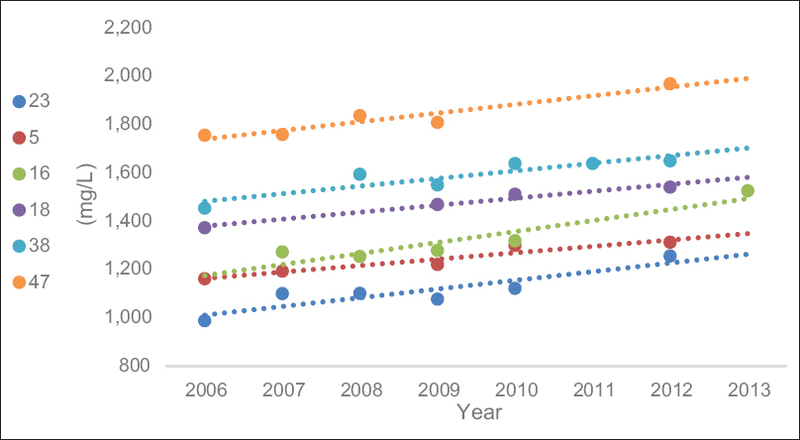 However, an ascending trend is observed in the mean of salinity over the time [Figure 2]. According to the given data, among the under research wells, the well No. 27 showed the lowest salinity and the well No. 47 the highest. While the highest ratios of salinization were detected in wells No. 53 and 55, the lowest ratio of increasing dissolved solids was in the well No. 54 [Figure 3], [Figure 4], [Figure 5]. Recently, in many parts of Iran, groundwater salinity has been increased in parallel to groundwater level drop resulted from more withdrawal from water tables, for example, Abadeh et al. study in Ziyadabad district, Sirjan in east south of Iran achieved similar results in agreement with our findings. According to Huang et al. study in a coastal aquifer, in addition to the geological characteristics of the aquifer and precipitation, the amount of groundwater exploitation affects its salinity. A reverse relationship with low correlation coefficient has been found between annual precipitation and salinity level in groundwater which is compatible with our findings.,, The trend of groundwater salinization in north of Kashan plain was investigated by Torabi. He declared that the average electrical conductivity of groundwater had been increased from about 1350 to 6930 mmhos/cm, during 1965–1997 and the land subsidence stated about 13 m for the same period. Furthermore, our finding is well-matched to Karami et al. study in 2011 on water salinity changes in Sarab plain. They stated that groundwater salinity level in Sarab plain has been increased during a 10-year period. The minimum salinity has been stated for foothills surrounding the plain while the salinity increased toward the center and the west of the plain. In addition to prolonged drought, excessive withdrawal and proximity to the Salt Lake that contribute to changes in the salinity of groundwater in Kashan plain different geological formations has been caused some spatial variations too. Our study showed that groundwater salinization in Kashan plain has an upward trend which can relate to more withdrawal from the water table in the recent decades. Since it can lead to numerous socioeconomical and economical crises, it seems that reducing of water demand is the best way to prevent the salinization of groundwater in this plain. Because the main consumer of groundwater in the plain is agricultural activities, water demand management in the agricultural sector has become a priority. The authors are grateful to Kashan Water and Wastewater Company for data supply. This work was supported by Marvdasht Branch, Islamic Azad University. This paper has been extracted from the results of dissertation NO: 48140402902020. Bouchaou L, Michelot JL, Qurtobi M, Zine N, Gaye CB, Aggarwal PK, et al. Origin and residence time of groundwater in the Tadla basin (Morocco) using multiple isotopic and geochemical tools. J Hydrol 2009;379:323-38. Karami F. The study of salinity changes of groundwater sources in Sarab plain. Tabriz Univ Geogr 2012;16:101-22. Ebrahimi M, Kazemi H, Ehtashemi M, Rockaway TD. Assessment of groundwater quantity and quality and saltwater intrusion in the Damghan basin, Iran. Chem Erde Geochem 2016;76:227-41. Jahanshahi R, Zare M. Hydrochemical investigations for delineating salt-water intrusion into the coastal aquifer of Maharlou Lake, Iran. J Afr Earth Sci 2016;121 Suppl C: 16-29. Kusimi JM, Kusimi BA. The hydrochemistry of water resources in selected mining communities in Tarkwa. J Geochem Explor 2012;112:252-61. Li J, Wang Y, Xie X, Su C. Hierarchical cluster analysis of arsenic and fluoride enrichments in groundwater from the Datong basin, Northern China. J Geochem Explor 2012;118:77-89. Lagnika M, Ibikounle M, Boutin C, Sakiti EN. Groundwater biodiversity and water quality of wells in the Southern region of Benin. Comptes Rendus Chimie 2016;19:798-806. Jamshidzadeh Z, Mirbagheri SA. Evaluation of groundwater quantity and quality in the Kashan Basin, Central Iran. Desalination 2011;270:23-30. Mahmoodzadeh D, Ketabchi H, Ataie-Ashtiani B, Simmons CT. Conceptualization of a fresh groundwater lens influenced by climate change: A modeling study of an arid-region island in the Persian Gulf, Iran. J Hydrol 2014;519:399-413. Kut KM, Sarswat A, Srivastava A, Pittman CU Jr., Mohan D. A review of fluoride in African groundwater and local remediation methods. 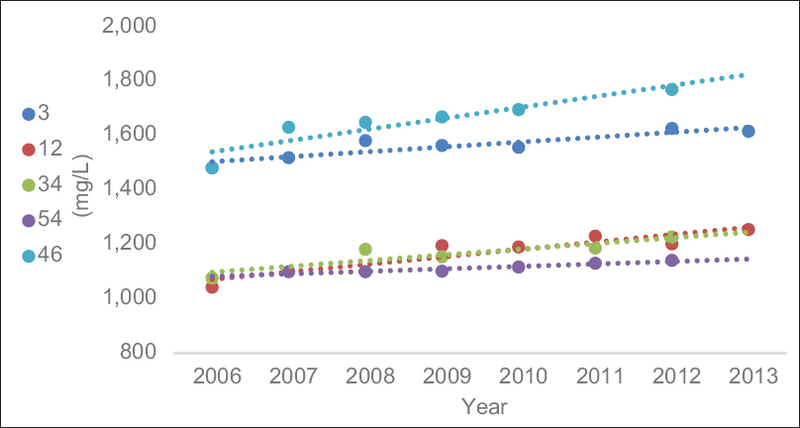 Groundwater Sustain Dev 2016;2-3:190-212. Gautam SK, Maharana C, Sharma D, Singh AK, Tripathi JK, Singh SK. Evaluation of groundwater quality in the Chotanagpur plateau region of the Subarnarekha river basin, Jharkhand State, India. Sustain Water Q Ecol 2015;6:57-74. Nguyen TT, Kawamura A, Tong TN, Nakagawa N, Amaguchi H, Gilbuena R Jr. Hydrogeochemical characteristics of groundwater from the two main aquifers in the Red River Delta, Vietnam. J Asian Earth Sci 2014;93:180-92. Ojha CS, Singh VP, Adrian DD. Assessment of the role of slit as a safety valve in failure of levees. Int J Sediment Res 2008;23:361-75. Osinowo OO. Water quality assessment of the Asata River catchment area in Enugu Metropolis, Southeast Nigeria. J Afr Earth Sci 2016;121:247-54. Seckin G, Yilmaz T, Sari B, Ersu CB. Groundwater hydrochemistry at the Mediterranean coastal plains – The case of Silifke, Turkey. Desalination 2010;253:164-9. Kalantari N, Heidari MJ, Rahimi M. Finding and managing potential finding juicy crisis: A case study of Zideon Plain, Khouzestan Province. Engineering Geology 2009;3:591-614. Torabi A. Investigating trend of groundwater susanation in the North of Kashan Plain. Desert 1999;4:1-22. Valipoor M, Karimian E, Malakoti M, Khoshgoftarmanesh A. The trend of salinity development and degradation of agricultural lands in the Shams Abad area of Qom province. Water Soil Sci (Sci Technol Agric Nat Resour) 2008;12:683-91. Ghazavi R, Yaghob Y, Abbasali V, Sadatinejad SJ. Location of Suitable Fields for Storing Heavenly Deserts Using GIS (Case study of Kashan plain). Persian Geography Papers; 2014. p. 85-96. Miranzadeh M, Mesdaghinia M, Heydari M, Yonosian M, Naddafi K, Mahvi AH. Investigation of chemical quality and chlorination of drinking water in villages of Kashan. Health system research. 2010;6(Suppl):889-97. Mirzavand M, Ghasemiyeh H, Sadatinejad SJ, Akbari M. Comparison of artificial neural network models and multivariate regression in estimation of groundwater quality changes (Case Study: Kashan Aquifer). Water Soil Knowl (Agric Knowl) 2015;25:207-20. Zarei M, Sedehi F, Raeisi E. Hydrogeochemical characterization of major factors affecting the quality of groundwater in Southern Iran, Janah Plain. Chem Erde Geochem 2014;74:671-80. Re V, Sacchi E, Allais E. The use of nitrate isotopes to identify contamination sources in the Bou-Areg Aquifer (Morocco). Proc Earth Planet Sci 2013;7:729-32. Sako A, Bamba O, Gordio A. Hydrogeochemical processes controlling groundwater quality around Bomboré gold mineralized zone, Central Burkina Faso. J Geochem Explor 2016;170:58-71. Ghazifard A, Moslehi A, Safaei H, Roostaei M. Effects of groundwater withdrawal on land subsidence in Kashan Plain, Iran. Bull Eng Geol Environ 2016;75:1157-68. Dieng NM, Orban P, Otten J, Stumpp C, Faye S, Dassargues A. Temporal changes in groundwater quality of the Saloum coastal aquifer. J Hydrol Reg Stud 2017;9:163-82. Farid I, Zouari K, Rigane A, Beji R. Origin of the groundwater salinity and geochemical processes in detrital and carbonate aquifers: Case of Chougafiya basin (Central Tunisia). J Hydrol 2015;530:508-32. Abadeh M, OUNAGH M, Mosaedi A, Zainoldini A. The study of effects of water table drawdown on the salinity of groundwater in Zeydabad area, Sirjan. J Agricultural Sciences and Natural Resources 2006;13:18-27. 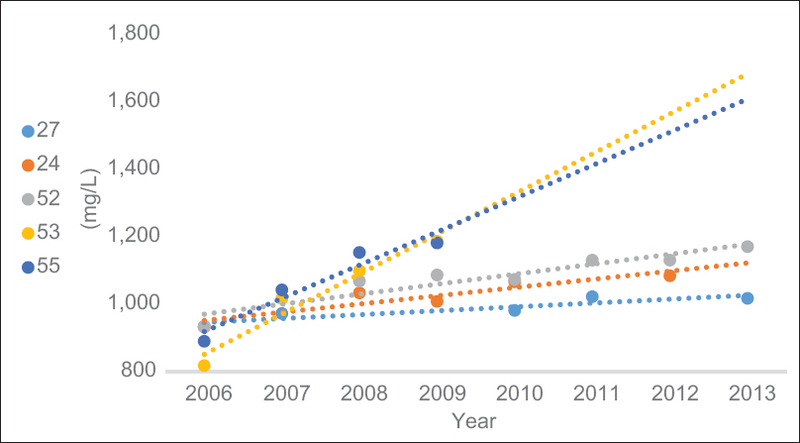 Huang G, Sun J, Zhang Y, Chen Z, Liu F. Impact of anthropogenic and natural processes on the evolution of groundwater chemistry in a rapidly urbanized coastal area, South China. Sci Total Environ 2013;463-464:209-21. Machiwal D, Jha MK. Identifying sources of groundwater contamination in a hard-rock aquifer system using multivariate statistical analyses and GIS-based geostatistical modeling techniques. J Hydrol Regional Stud 2015;4:80-110. Madioune DH, Faye S, Orban P, Brouyère S, Dassargues A, Mudry J, et al. Application of isotopic tracers as a tool for understanding hydrodynamic behavior of the highly exploited Diass aquifer system (Senegal). J Hydrol 2014;511:443-59. Chongo M, Wibroe J, Staal-Thomsen K, Moses M, Nyambe IA, Larsen F, et al. The use of Time Domain Electromagnetic method and continuous vertical electrical sounding to map groundwater salinity in the Barotse sub-basin, Zambia. Phys Chem Earth Parts A B C 2011;36:798-805. Karami F, Kazemi H. Spatial monitoring of groundwater salinity in drought and wetland index (Case: Tabriz plain). Geogr Dev 2012;10:79-94.